The wooden caddy has been languishing in the shed for a few years and I brought it inside along with several other re-finds. I picked up a new ABC stencil last week and ... the CADDY had a name and a purpose. After finishing the stencil I picked some pretties from the welsh dresser, starting with the dried hydrangea and the little birds. The supplies and the wood are in the photo below. I taped the 'bottom line' for the stencil first, cut out my white cardboard (around the end letters, rectangle shape) and measured the beginning/end placement of the letters. This is the second time I pre-planned my lettering on paper before stencilling. Works well for me. 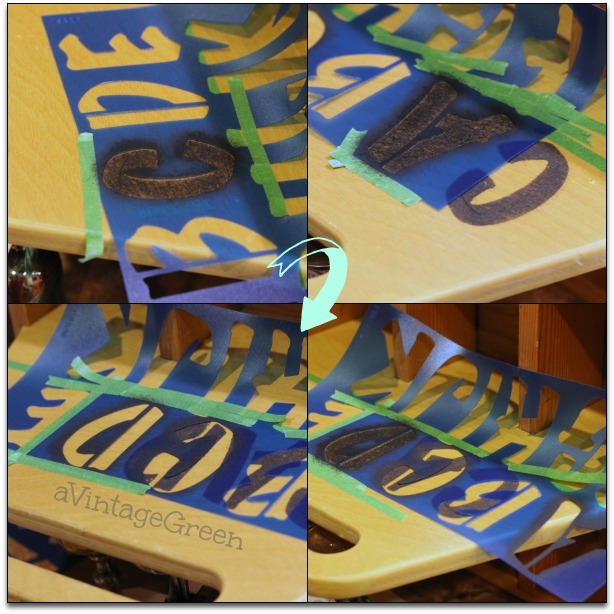 This was my first try using a letter stencil in a tight space that caused the stencil to curl. The first try with the C was smudgy so I quickly washed it off, dried (and learned that black paint sinks in to wood even though it was cleaned off). I also quickly learned that I had to tape the stencil in place, plus add a piece of tape to keep the paint off the wood (ie: see letter D) and that I had to keep my fingers (in this case my right hand fingers since I am left handed) pressed on the edges of the letter being stencilled or there would be bleed-under. I stencilled one letter, removed the stencil, waited several minutes, taped the next letter in place, stencilled again etc. until finished. Waxed the next day. Multiple uses for a small caddy, this was quite a bit of silly fun, using what was in sight and handy. March was a good month for exploring and making new signs, you can see those posts at Fresh Eggs, Happy Easter, Spring. It's very cute! And we can use those totes for so many things. 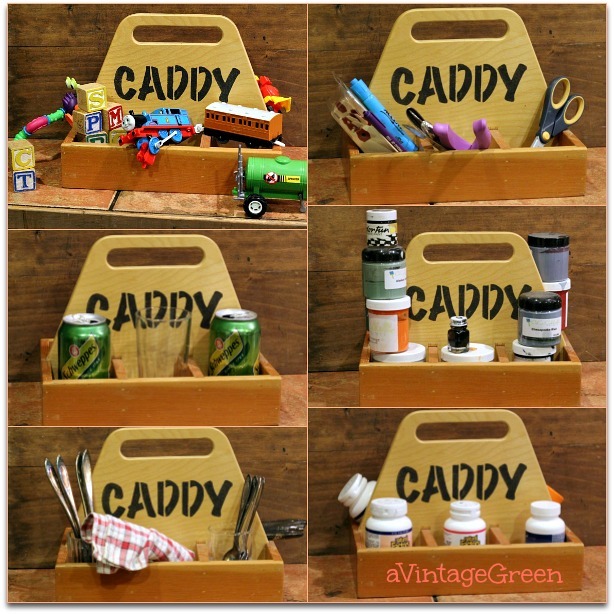 This is super cute and I love all of the possibilities for toting many things to and fro. Thank you for joining us today, it is always such a pleasure to have you! 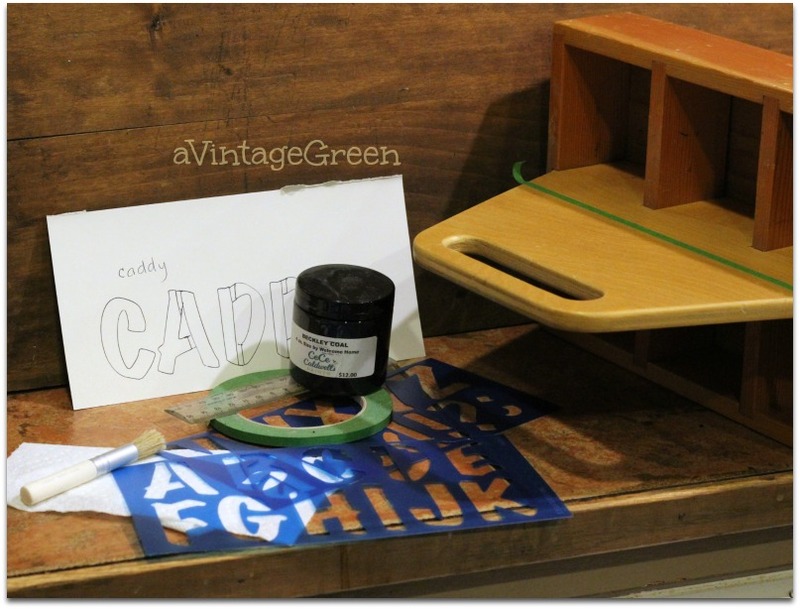 Joy, I love your caddy vignette with the hankie and little birds ~ Such a versatile piece! Thank you for sharing @Vintage Charm! Pinning to our Features & Favorites! Joy, Great idea!! Love how your caddy turned out! Cute Caddy, love that it's not deep! Very cute! Thanks for sharing ~have a great weekend! That is a good idea to sketch it out on paper first. It frustrating to end up with a slightly off center word. Such a practical project, would definitely use it most for the drinks and picnic supplies. You were so smart to figure out your lettering right away/first. When I try to make signs spacing of lettering is always my down fall. I So functional and especially versatile.f hubs can make one like it. love the dividers and that it's two sided. These kinds of things normally don't or well for me. I never prepare and I pay the price. Your little caddy looks like an awful lot of fun to play with. Thanks for sharing at the creative circle link party! It looks great and what a useful purpose it has now. Pinned. Thanks for partying with us at Snickerdoodle Sunday. Hope to see you again this week.